This document is a non-normative reference, which provides an overview of Web Components. It summarizes the normative information in the respective specifications in easy-to-digest prose with illustrations. As mentioned earlier, this document is a work in progress. It relates all concepts associated with Web Components into one coherent, non-normative narrative. Each concept is separately being refined and developed in a normative document. What is described here may sometimes lag behind the normative documents, and may sometimes be pointing the way ahead for those documents. Once all of the forward-looking information is extracted into the respective normative documents, this document will undergo an ultimate update to accurately summarize the information in the normative documents. Decorators, which apply templates based on CSS selectors to affect rich visual and behavioral changes to documents. Imports, which defines how templates, decorators and custom elements are packaged and loaded as a resource. Each of these pieces is useful individually. When used in combination, Web Components enable Web application authors to define widgets with a level of visual richness and interactivity not possible with CSS alone, and ease of composition and reuse not possible with script libraries today. This document discusses each of these pieces. Each section builds on the last to illustrate how authors can use the pieces of Web Components in combination. The HTML Templates specification is the normative description of this part of Web Components. The <template> element contains markup intended to be used later. The content of the <template> element is parsed by the parser, but it is inert: scripts aren't processed, images aren't downloaded, and so on. The <template> element is not rendered. Because what is contained in the template is not in the document, but in the content document fragment, appending a copy of the template content in this way makes it "live" so scripts run and images are fetched at this point. For example, templates can be used to store large scripts inline in the document, but not incur the cost of parsing them until they are needed. 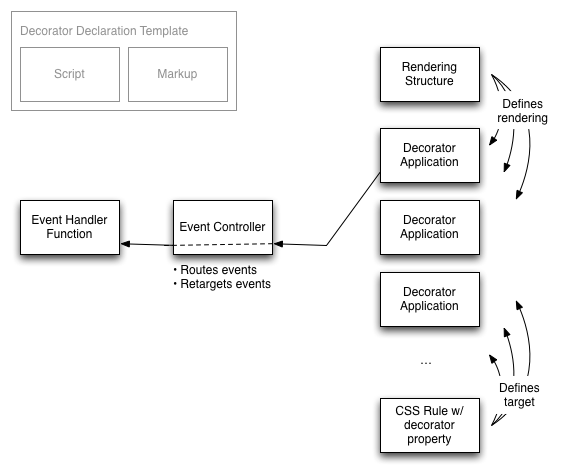 Decorators, unlike other parts of Web Components, do not have a specification yet. One concept for Decorators that could be pursued is sketched in this section. There is no normative description of this part of Web Components. The <content> element is the point where the content of the decorated element (the element's children) should appear in the rendering. Even though the decorator CSS property can point to any resource on the Web, the decorator will not be applied unless its definition is loaded by this document. The markup that generates the presentation is limited to be purely presentational: it may never run script (including inline event handlers) and it cannot be editable. Decorators can also attach event handlers to implement interactivity. Because the decorators are transient, it is not useful for the decorator to attach event listeners to the nodes in the template or rely on any state, since it perishes any time the decorator is applied or unapplied. 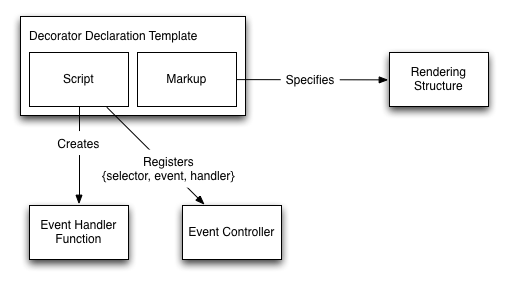 Instead, decorator events are mediated by an event controller. The event controller interprets the array and routes events originating in any of the places that the decorator is applied to the event handler. When the event listener is called, the target of the event is the content that the decorator was applied to, not content from the template. In the above example, clicks on the ▾ (which is defined in the template) are delivered to the clicked function (which is registered to the #summary element, also defined in the template) but the event.target property refers to the decorated <details> element. This retargeting is necessary because the decorator specifies presentation; it does not affect the DOM structure of the document. The Custom Elements specification is the normative description of this part of Web Components. Custom elements are new types of DOM elements that can be defined by authors. Unlike decorators, which are stateless and ephemeral, custom elements can encapsulate state and provide script interfaces. The following table summarizes the key differences between decorators and custom elements. The name attribute specifies the name of the custom element, by which it will be referred to in markup. These names must include a hyphen. When there isn't a HTML element that is semantically close to their custom element, authors can omit the extends attribute. These elements will use the value of the name attribute as a tag name. For this reason, these kinds of elements are called custom tags. A user agent that does not support custom elements will treat this as the semantically undifferentiated HTMLUnknownElement. The properties of the last value of the script will be copied to a prototype object created for you. In the above example, <tick-tock-clock> elements will have a tick method. Custom elements have lifecycle callbacks which can be used to set up presentational aspects of a custom element. These are: readyCallback, which is called after a custom element is created; insertedCallback, which is called after a custom element is inserted into a document; and removedCallback, which is called after a custom element is removed from a document. As the definition of a custom element is loaded, each element that matches the definition is upgraded. The upgrade process updates the prototype of the element, which makes the element's API available to script, and invokes lifecycle callbacks. // Chime ALL the clocks! An element that wants to notify other parts of the page that it has been upgraded could dispatch a custom event to do so. Scripts that want to delay interacting with the element until it has been upgraded can listen to this event. The Shadow DOM specification is the normative description of this part of Web Components. Shadow DOM is an adjunct tree of DOM nodes. These shadow DOM subtrees can be associated with an element, but do not appear as child nodes of the element. Instead the subtrees form their own scope. For example, a shadow DOM subtree can contain IDs and styles that overlap with IDs and styles in the document, but because the shadow DOM subtree (unlike the child node list) is separate from the document, the IDs and styles in the shadow DOM subtree do not clash with those in the document. Shadow DOM can be applied to an element by calling the createShadowRoot method. This returns a ShadowRoot node which can then be populated with DOM nodes. An element with shadow DOM is called a shadow host. When an element has shadow DOM, the element's children are not rendered; the content of the shadow DOM is rendered instead. A shadow DOM subtree can use a <content> element to specify an insertion point in the rendered output. The host's children are displayed at the insertion point. The <content> element acts as an insertion point for rendering only—it does not change where the elements appear in DOM. Insertion points let you reordered or selectively omit rendering the host's children, but they will not cause something to be rendered multiple times. Tree order dictates when each of these elements takes a pass at selecting the children. Once the child is selected to be rendered at one insertion point, it can't be claimed by another one, which is why the details-open decorator only renders the summary once. Conceptually, first the document and the first shadow root is combined to create the following virtual DOM tree. The insertion points have been erased and the host element's child nodes appear in their place. Next, this intermediate virtual tree is combined with the second shadow root to create another virtual DOM tree. All of the breaking news is now at the top. This is because of the <content class="highlight" select=".breaking"> insertion point. Note that the elements are reordered despite the fact that the breaking class does not appear in the #ticker element's children, because insertion points pick from the intermediate virtual tree. Projecting a node through multiple insertion points in this way is called reprojection. Any element can have more than one shadow DOM subtree. Don't look so puzzled! In fact, this is common when you are extending a custom element that already has a shadow DOM subtree. What happens to that poor old tree? We could just ditch it for the new arboreal hotness, but what if you don't want to? What if you want reuse it? The base custom element's shadow DOM. The first derived custom element's shadow DOM. Ad-hoc shadow DOM added using script. Next, we take this stack of shadow DOM subtrees and traverse it backwards, starting with the last-applied (or youngest) subtree. Each <content> insertion point, encountered in tree order, grabs the host element's children that it needs as usual. If we do, we plop the next shadow subtree in our list in place of the <shadow> element, and rinse-repeat first replacing <content> insertion points, then the first <shadow>, until we reach the end of the stack. The most recently applied shadow DOM subtree has the best shot of getting fresh children for its <content> insertion points. When building a custom element it is natural to think about its markup (attributes and content) and script interface. It is often just as important to think about how it interacts with the styles in the page. Shadow DOM gives authors a lot of control over how content in shadow DOM interacts with styles. The shadow DOM subtree is surrounded by an invisible boundary, which by default applies user agent styles but not author styles. However inheritance still works as usual. This is usually what you want: In the <sailing-watch> example above, if the page is styled so that the surrounding text is a beautiful sea green, in keeping with a nautical theme, the text inside the shadow DOM (for example the "N" of the direction indicator) will be sea green too because color is an inherited property. But if the author has styled all <div> elements to have orange borders, the direction indicator will not have an orange border because the border properties are not inherited properties. A shadow root has two properties to control this behavior. The first, applyAuthorStyles, will apply the author stylesheet. Setting this property is appropriate when writing shadow DOM that should match the appearance of the surrounding content as closely as possible. There is one caveat: CSS selectors are matched against the shadow DOM subtree, not the flattened tree. Pay attention to child, descendant, sibling and "nth-of-x" selectors when using this property. The second shadow root property which controls the effect of surrounding styles on content in a shadow DOM subtree is resetStyleInheritance. If this property is set to true all properties are reset to initial values at the shadow boundary. If applyAuthorStyles is false and set resetStyleInheritance is true, you're back to a clean slate. Your element is insulated from the styles in the page—even inherited properties—and you can use a browser reset stylesheet to build up the exact style you want. This contains two rules which use ::distributed. The left half of the selector applies to the shadow DOM subtree; the part of the selector in parentheses applies to elements distributed to those insertion points. So the first content::distributed(*) selector applies to all elements distributed to <content> insertion points; while the second *::distributed(.breaking) selector applies to all elements with class breaking distributed to insertion points, giving them a healthy maroon glow. Given this specific shadow DOM the author could reduce redundancy by writing this selector .highlight::distributed(*) instead. A pseudo-element is useful for opening up all of the properties of a specific element for styling by the author. CSS Variables are useful for letting the author style a narrow set of properties, but ones that are specified repetitively such as the colors in a theme. The HTML Imports specification is the normative description of this part of Web Components. Only <decorator> elements and <element> elements are interpreted by the user agent, although the DOM of this document is available to script through the import property. Documents which are retrieved cross-origin use CORs to determine that the definitions are designed to run cross-site. This section provides an index of interfaces and elements defined by Web Components, with links to their normative definitions.